Salsa is intriguing. One ingredient added or left out can completely change its flavor. You can make it sweet or spicy. Mild, medium, or hot. Use peppers with the seeds or without them. Make fresh salsa, or cook it. The way people feel about their salsa is about how wine experts gain their knowledge about wine. The key is in tasting and continuing to taste. Eventually, you learn which foods go best with the sweet and which ones are suited best with the spicy. I like to make salsa from raw, fresh vegetables. Sometimes I’ll add a canned vegetable. Like I mentioned, if I don’t write the recipe down, it’s a secret (even from me the salsa creator), and I’ll forget what made the last salsa so different from the one before. How Long Can Fresh Salsa Be Refrigerated? Salsa tastes better when it sits overnight. The last time I made some, at first, I wasn’t convinced that I was satisfied with the flavor. The next day, however, the flavor was perfect. My husband kept saying it was the best I had made and asking if I wrote it down. I made sure that I recorded the recipe. Fresh salsa that is refrigerated should be good for two or three days. It won’t last longer than that in my house, anyway. Leave it in the frig as long as you would have kept the vegetables if they weren’t blended into the salsa. You wouldn’t want to eat a shriveled-up pepper or mushy tomato. Mix vegetables in a blender. Put salsa in a container, and put it in the frig to set overnight. If you like surprises, I have one coming up next month. It’s a very good crockpot recipe that I used the salsa in. But I’m not telling which recipe yet. Suspense is not only for novels, you know. 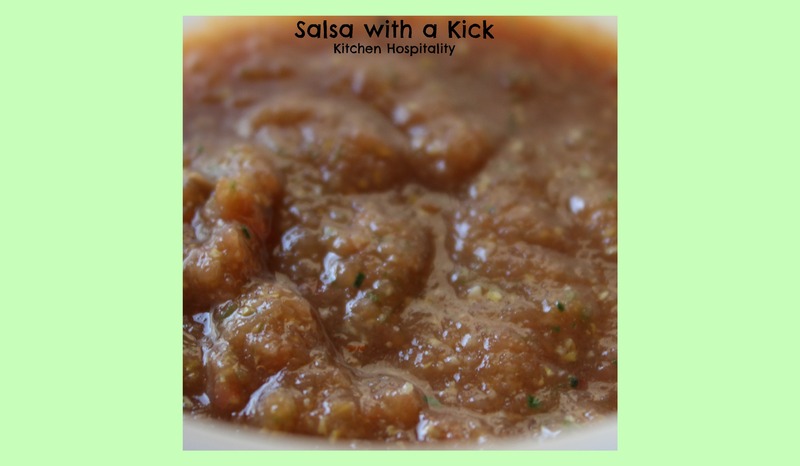 At the least, you know part of the secret – the Sweet and Spice Salsa is in the recipe. Until the recipe is revealed in April, I hope to see you back at the next blog post! I have a few “secret” recipes that I made, but didn’t write down. Occasionally, I get complaints that “this doesn’t take like the last time.” Did you blend the corn with the other vegetables, or stir it in after the salsa was completed. I blended the corn with the other vegetables.